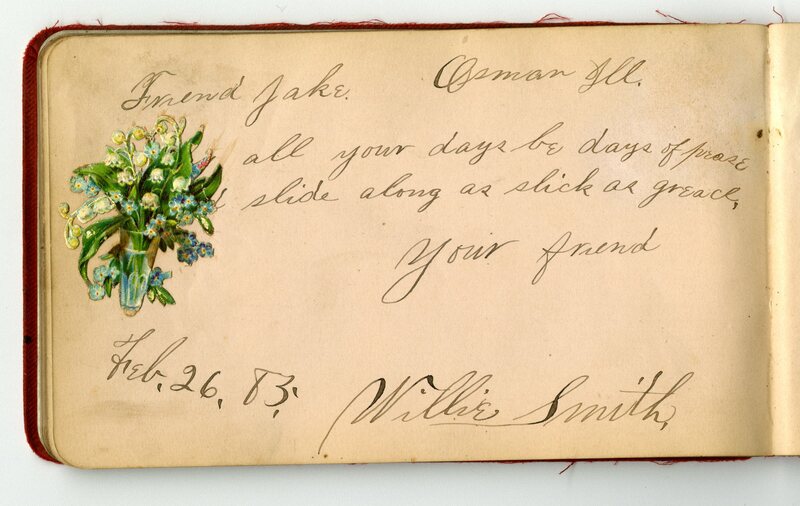 Autograph books provide a fascinating way to understand social interactions and genealogy. These objects contain signatures and messages from one’s friends and family, handwriting practice, drawings, and memorabilia. While going through the Indiana University Archives small collections, I found four of these books dating from the nineteenth century. I was immediately charmed by their Victorian aesthetic and the sincere sentiments written within. I also discovered how they provide intriguing paths into family histories of the Midwest—and of Indiana University students. Two of the autographs books were created by a certain Jacob A. Zoll from 1881-1886, and the other from 1885-1897. The first book captured my attention because even though it dates back to the 1880s, it is full of colorful paper stickers in the form of spring flowers, cherubs, and wildlife. It reminded me of my own adolescent obsession with Lisa Frank stickers. It was not immediately clear to me who Zoll was, or what (if any) relationship he had with Indiana University. As an art historian-turned-training-archivist, I decided to beef up my genealogy research skills to find this out. I turned to the Ancestry Library Edition, a resource accessible through the IU Libraries, and discovered through U.S. census records that Zoll was born in Ohio in 1861. By 1880, he lived in Belle Flower, Illinois with his family. When he was older, Zoll moved to Urbana, Illinois, became a carpenter, and lived with his wife and two stepsons. Learning about Jacob Zoll’s biography helped solve another mystery—the identity of Clara Burkett, the creator of another one of the autograph books at the IU Archives. Clara’s book was presented to her by her father on September 24, 1879. She collected her first signature four days later, in Marshall, Indiana. Her friend Mary English wrote simply, “Remember me Clara.” The book mostly contains poems and signatures from schoolmates and cousins, scattered across southern Indiana and Illinois counties. Based on my census research, I confirmed that Clara was, in fact, Jacob’s wife. Naturally wanting to find more information about Clara, I soon discovered how difficult it can be to track genealogy for women. In order to trace her in Ancestry records, I had to search her various used names (and spellings) across her single and married life. She was born Clara Burkett in Adams County, Pennsylvania, in 1864. A minister’s daughter, her family moved around Indiana and Illinois in the late 1800s. In 1882, she married John Milton Wolfe. They had two children, Elmer and Wirskenn (known as “Winn”). According to the Danville Daily News, tragedy struck in August 1887, when John Wolfe died of typhoid fever at the age of 26. Clara raised her sons as a single mother until 1890, when she married Jacob in McLean County, Illinois. “My friend mother is a comforter and love to me. That when you read this you remember me. 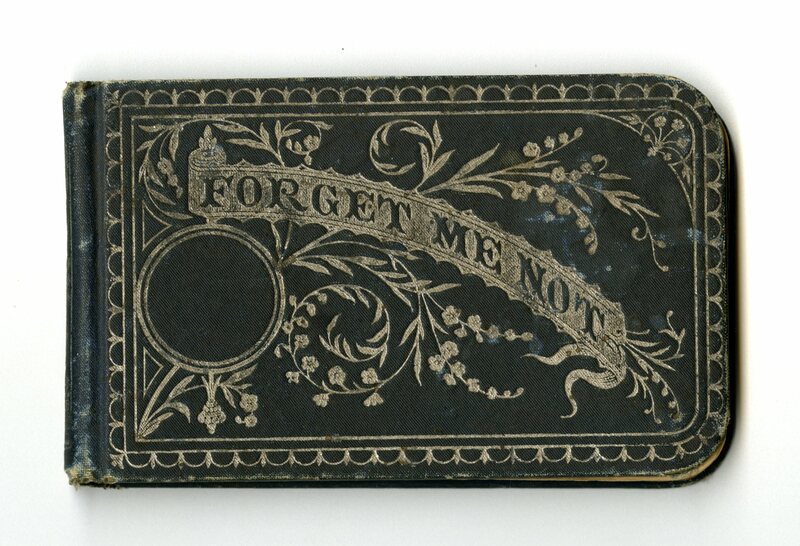 Also touching, Elmer wrote in his stepfather’s autograph book on January 25, 1895: “When this you see/Think of me/Your boy, Elmer.” For me, this experience was a powerful example of how archival research can bring to the surface individual voices and family stories that may otherwise be lost in historical narratives. 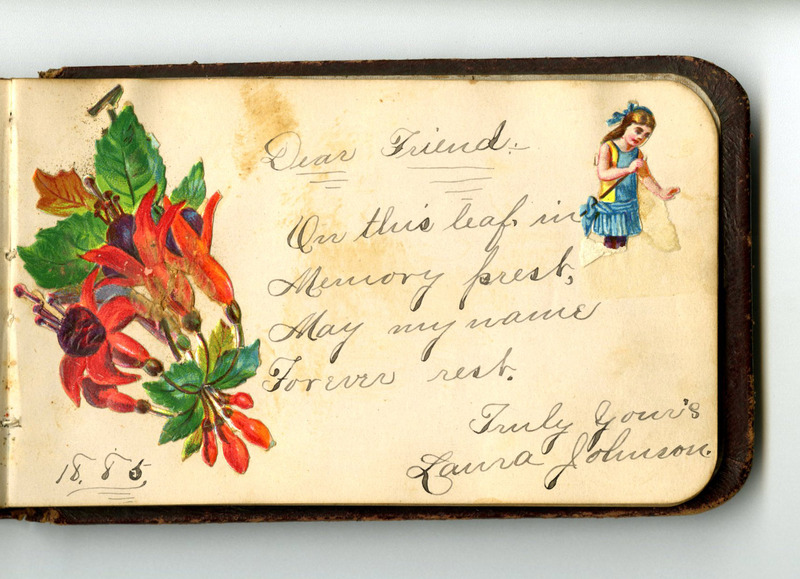 To identify the mysterious “Rosa,” I turned to the rosters of Indiana University graduates held in the Archives reading room, and noted relevant surnames from these autograph books. After cross-referencing the names with Ancestry records, I found one exact match: Ralph Verlon Wolfe, who graduated between 1936 and 1939. His mother’s name? Rosa Wolfe. Coincidences aside, I found it highly probable that Ralph’s mother was Rosa Wolfe, the autograph book’s original owner. Genealogy records provided evidence that Rosa lived in southern Illinois and Indiana, and had some of the same relatives as Elmer and Winn Wolfe. Thus, I made an educated connection that Ralph Wolfe (or one of his own descendants) donated this entire set of autograph books as a family collection. Combing through genealogy and I.U.-specific records to map these autograph books was a real archival journey for me. The autograph books provide an intimate, and even touching glimpse into historical family dynamics. To view these special objects yourself, contact the Indiana University Archives. 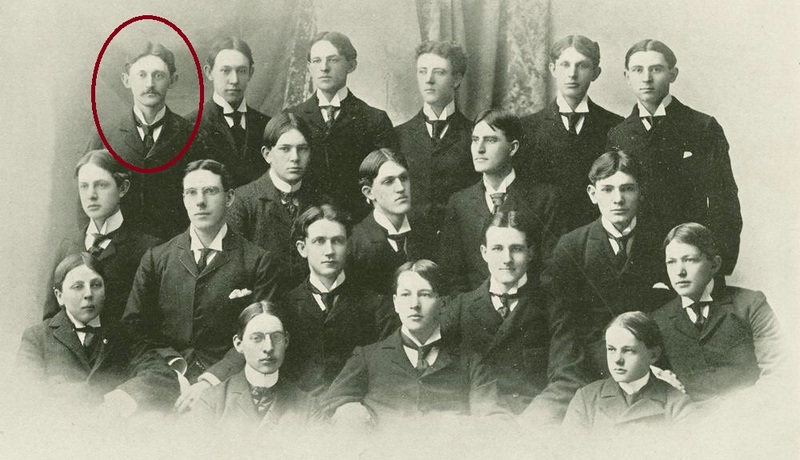 In this Sincerely Yours post, we will explore IU through the eyes of Harry V. Craig, an Indiana native of Noblesville who came to IU in 1890 to study history. The IU Archives first acquired a portion of the Harry V. Craig papers back in 2000, but later received additional materials in 2003 from a man named Mark Brattain. Mr. Brattain had seen the Harry V. Craig papers finding aid on the Archive’s website and provided letters he found with his father, Hal Brattain, in a wooden box in the hayloft of a neighbor’s barn back in the 1970s. The barn belonged to the late Ray Forrer, who was probably some relation to Harry’s mother Elizabeth (whose maiden name was Forrer). Most of the letters contained in the Harry V. Craig Papers are correspondence he received from friends, family members (his father, brother, cousin, and mother), and fraternity brothers from Phi Kappa Psi. 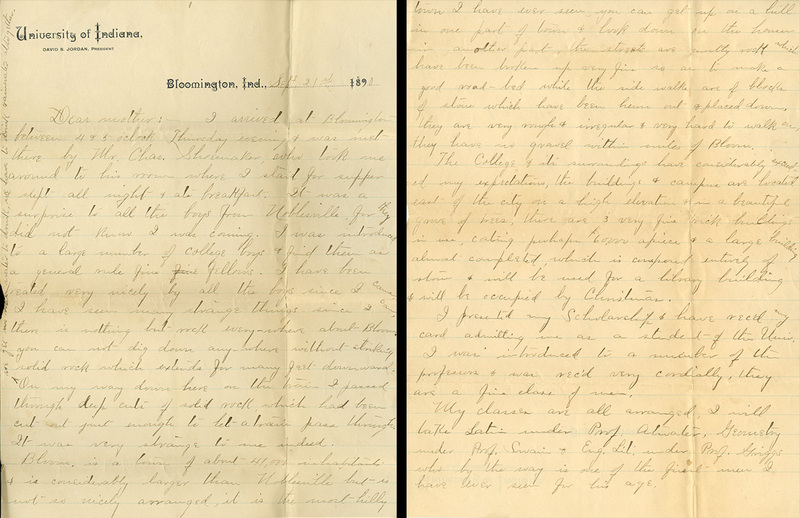 There are, however, a handful of letters by Craig himself detailing his experience at IU. In letters to his mother, Mr. Craig’s most frequent correspondent, Craig details his daily life and expenses as well as happenings around town and the campus. 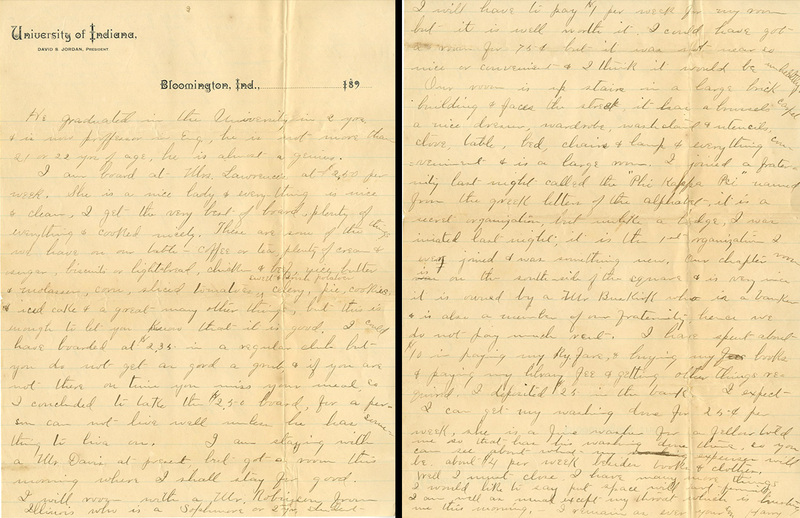 I arrived at Bloomington between 4 and 5 o’clock Thursday evening and was met there by Mr. Chas Shoemaker, who took me around to his room where I staid [sic] for supper slept all night and ate breakfast. It was a surprise to all the boys from Noblesville, for they did not know I was coming. I was introduced to a large number of college boys and find them as a general rule fine fellows. I have been treated very nicely by all the boys since I came. I have seen many strange things since I came. There is nothing but rock everywhere about Bloom. you can not [sic] dig down anywhere without striking solid rock which extends for many feet downward. (we get no more water to drink, we have to drink rainwater altogether) On my way down here on the train I passed through deep cuts of solid rock, which had been cut out just enough to let a train pass through. It was very strange to me indeed. Bloom. is a town of about 41,000 inhabitants and is considerably larger than Noblesville but is not so nicely arranged, it is the most hilly town I have ever seen, you can get up on a hill in one part of town and look down on the houses in another part, the streets are mostly rock which have been broken up very fine so as to make road-bed while the side walks [sic] are of blocks of stone which have been hewn out and placed down, they are very rough and irregular and very hard to walk on, they have no gravel within miles of Bloom. The College and its surroundings have considerably exceeded my expectations, the buildings and campus are located east of the city on a high elevation and in a beautiful grove of trees, there are 3 very fine brick buildings in use, costing perhaps $60,000 apiece and a large building almost completed, which is composed entirely of stone and will be used for a library building and will be occupied by Christmas. I presented my Scholarship and have rec’d my card admitting me as a student of the Univ. I was introduced to a number of the professors and was rec’d very cordially, they are a fine class of men. My classes are all arranged, I will take Latin under Prof. Atwater, Geometry under Prof. Swain and Eng. Lit. under Prof. Griggs who by the way is one of the finest men I have ever seen for his age. He graduated in the University in 2 yrs and is now [a] professor in Eng., he is not more than 21 or 22 yrs of age, he is almost a genius. I am board[ing] at Mrs. Lawrence’s at $2.50 per week. She is a nice lady and everything is nice and clean, I get the very best of board plenty of everything and cooked nicely. There are some of the things we have on our table – coffee or tea, plenty of cream and sugar, biscuits or light-bread, chicken and beef, sweet and Irish potatoes, nice butter and molasses, corn, sliced tomatoes, celery, pie, cookies, and iced cake and a great many other things, but this is enough to let you know that it is good. I could have boarded at $2.35 in a regular club but you do not get as good a grub, and if you are not there on time you miss your meal, so I concluded to take the $2.50 board, for a person can not [sic] live well unless he has something to live on. I am staying with a Mr. Davis at present, but got a room this morning where I shall stay for good. I will room with a Mr. Robinson from Illinois who is a sophomore or 2nd yr student. I will have to pay $1 per week for my room but it is well worth it. I could have got a room for 75₵ but it was not near so nice or convenient and I think it would be unhealthy. My room is up stairs [sic] in a large brick building and faces the street, it has a brussels carpet, a nice dresser, wardrobe, wash stand and utensils, stove, table, bed, chairs, and lamp and everything convenient and is a large room. I joined a fraternity last night called the “Phi Kappa Psi” named from the greek letter of the alphabet. It is a secret organization, but unlike a lodge, I was initiated last night, it is the 1st organization I even joined and was something new. Our chapter now is on the south-side of the square and is very nice it is [served] by a Mr. Buskirk who is a banker and is also a member of our fraternity, hence we do not pay much rent. I have spent about $10 in paying my Ry. [Railway] fare, and buying my books and paying my library fee and getting other things required, I deposited $25 in the bank. I expect I can get my washing done for 25₵ per week, she is a fine washer for a fellar told me so that has his washing done there. So you can see about what my expenses will be about $4 per week besides books and clothes. Well I must close. I have many more thigs I would like to say but space will not permit. I am well as usual except my throat which is bothering me this morning. 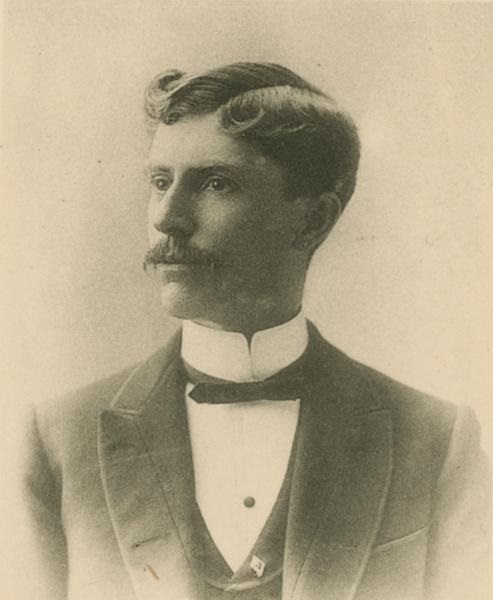 Craig graduated from Bloomington in 1896 with an AB in history. After graduating, he returned to Noblesville for a while to teach history and then went on to work a wide array of jobs including a salesman, hotel clerk, and a position with the National Engraving Company in New York. He was also the coordinator for the Denver Training Center of the Veteran’s Bureau at one point in his career. In 1962 the Alumni Association reached out to update their information on him, but found at that time that he was already deceased. He apparently passed away on November 2, 1955 in California. Many students are members of a club or two during college. It’s not uncommon. But, how many students can say they created an original club for themselves? What would this kind of informal club look like? Would you have rules? The Moonlight Pleasure Club constitution is a document which shows us exactly what kind of club a group of Indiana University students decided to create for themselves in 1892. The members of The Moonlight Pleasure Club were likely graduate students when they formed their club in 1892. They didn’t create a formal student organization or aim to recruit more members. No. These four students just sat down and wrote their own constitution. It appears that one male and one female student were the charter members who then initiated another male and female student into the club. 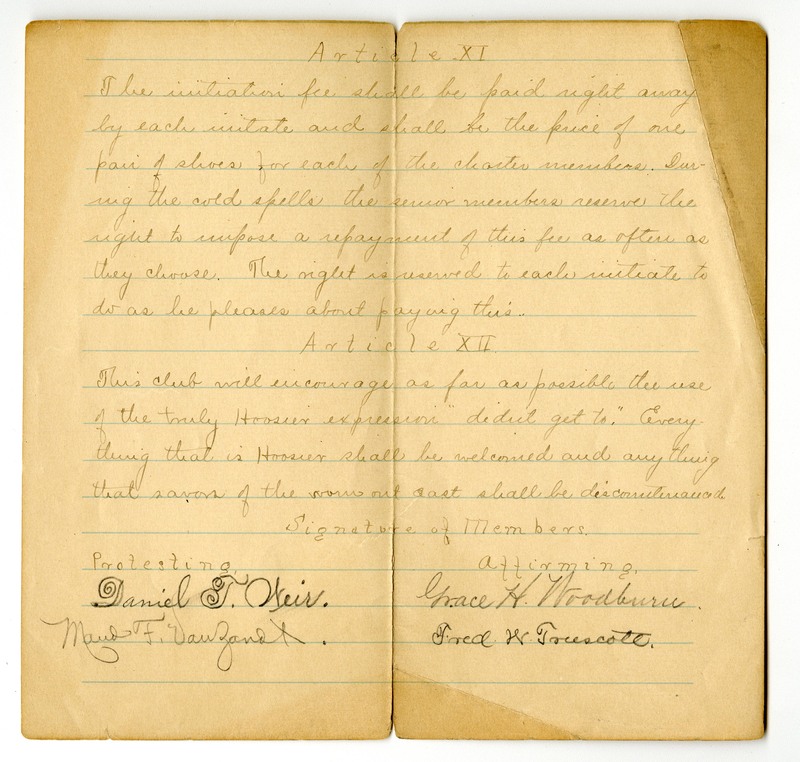 This initiation appears to have been the reason for the document’s creation since the constitution itself calls for the club to have four members only. The document includes twelve articles or rules, and has signatures from all four students including two labeled as protesting and two labeled as affirming. But, who were these students? What was this club for exactly, and why did they name it Moonlight Pleasure? Unfortunately, a thorough search of the archives has not yet yielded much more information about the club. The Arbutus IU yearbooks document each of the four student authors of the constitution and their time at IU, but there is no mention of the actual Moonlight Pleasure Club in any of the yearbooks. 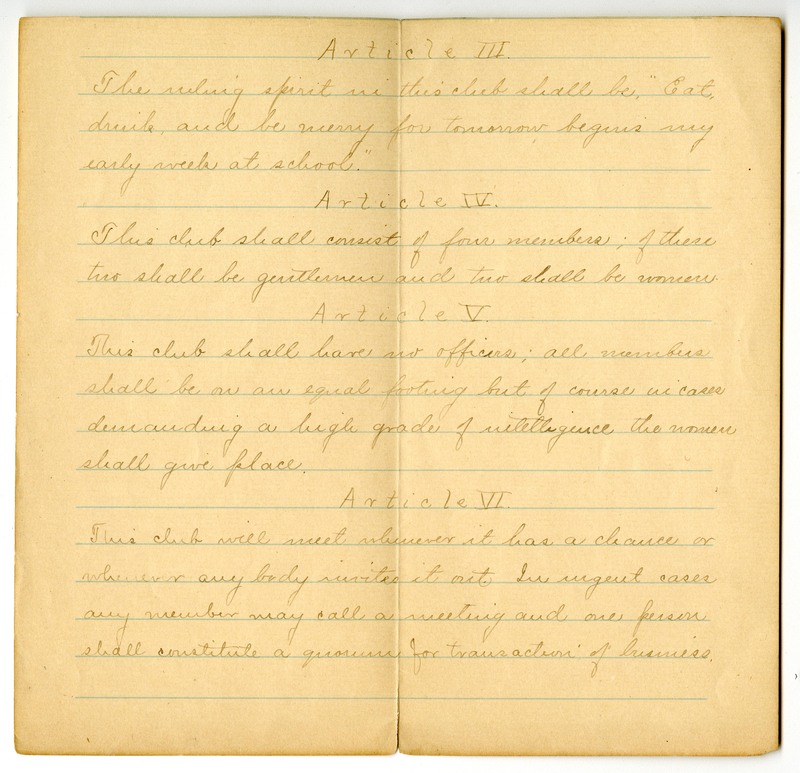 We don’t know much about this mysterious club, but the students who wrote and signed the club’s 1892 constitution were a bit easier to track down. The four members of The Moonlight Pleasure Club were of similar ages, but each studied different academic subjects at IU. Frederick Wilson Truscott (b. 1870 – d. 1937) graduated from Indiana University with his A.B. in German in 1891. 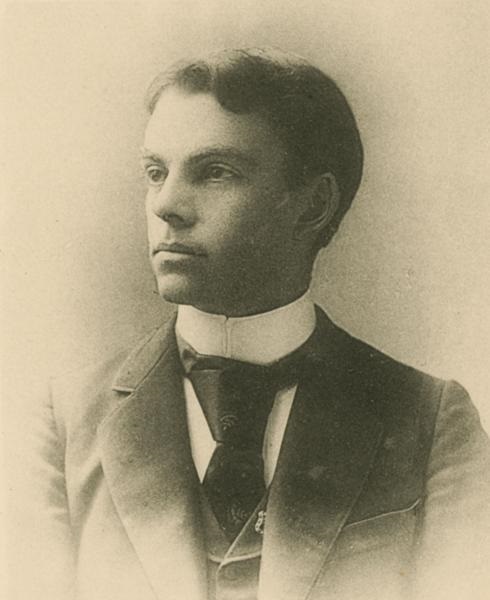 He earned his A.M. in 1892, and later obtained his Ph.D. Truscott eventually became a professor of German at Wilson College in Chambersburg, Pennsylvania. He also served in World War I in the U.S. Army. Daniel T. Weir (b. 1864 – d. 1949) graduated from IU with his A.B. in physics in 1891 and he obtained his A.M. in mathematics in 1893. He went on to teach in Indianapolis. Both Weir and Truscott contributed to war service efforts in various capacities. Maud Freeman Van Zandt (b. 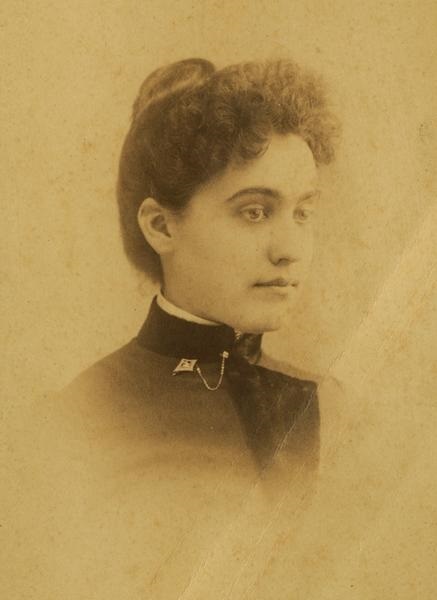 1868 – d. 1917) graduated from IU with her A.B. in English in 1888. Maud married and had children. She died at the age 48 after a severe case of pneumonia. Grace Helen Woodburn (b. 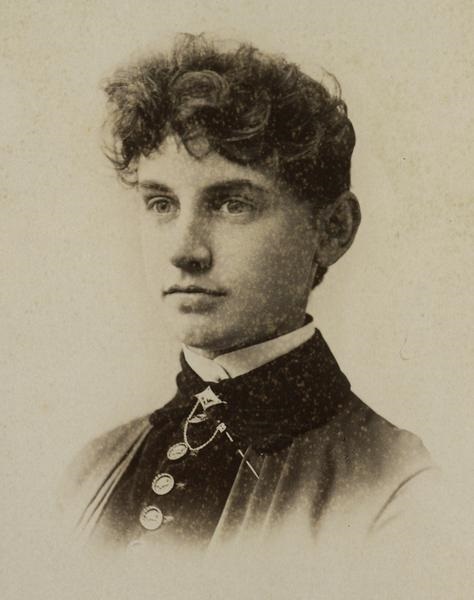 1865 – d. 1922) graduated from IU with her A.B. in 1885 and with her A.M. in Latin in 1894. Grace also married and worked in the home. Unfortunately, this is all that’s currently known about the students. The two men are known to have worked as a teacher and a college professor after their time at Indiana University. A line in the constitution’s Article I implies that all four were studying to either become teachers or to simply obtain a liberal arts education. The line reads: “The motto of this club shall be, ‘A little nonsense now and then is relished by the wisest men and some high school teachers. '” However, this interpretation of the line does not necessarily mean all members were educators. In the late nineteenth century and early twentieth century, it was common for women to gain a college education but then go on to primarily be homemakers and mothers. This seems to have been the case for Maud Van Zandt and Grace Helen Woodburn who both appear to have become a “house wife” after marriage according to U.S. Census records. While to this point we don’t know much more about these club members, the constitution itself can offer a few more clues into what the students were like and what they did as a club. Articles I., II., and III. explain that the club basically aimed to have fun together as a group of friends. The club was likely a chance for each student to get away from school work and stress. The next few articles in the constitution seem to contain stereotypical details and rules that a club might want to establish. The difference however, between this constitution and the usual sort of document used by a formal club is its tone. The student members of the Moonlight Pleasure Club made jokes and appeared to mock formal club rules while writing their constitution. But even some of their jokes are representative of the social milieu of the time. There are two instances when the document makes it clear that the male members have more power and status in the club than the women. Articles V. and VIII. seem to make jokes at the expense of the women club members. While there are no leaders or positions of power in the club, Article V. also says “of course in cases demanding a high grade of intelligence the women shall give place.” And though the club appears to be democratic, it also gives the “gentlemen” the ability to have the final say in any tied votes. But, were these rules all serious? Were students mocking social aspects of their time or did they seriously imagine men had a ‘higher grade of intelligence’ than women? Their constitution also says that the club “initiation fee the price of one pair of shoes for each of the charter members.” Is this a social idiom of the day, or were they mocking the often required fees for student organizations? Did they write this document as a joke with the aim to mock other university student clubs? Unless we find more about the Moonlight Pleasure Club, we might not find out if these students were joking or mocking other student clubs, or if this was a serious matter to these students. In any case, this document provides a unique glimpse of what a group of friends did for fun together. Below, you can look at the constitution for yourself! Can you find any more clues? A transcript of the constitution follows. 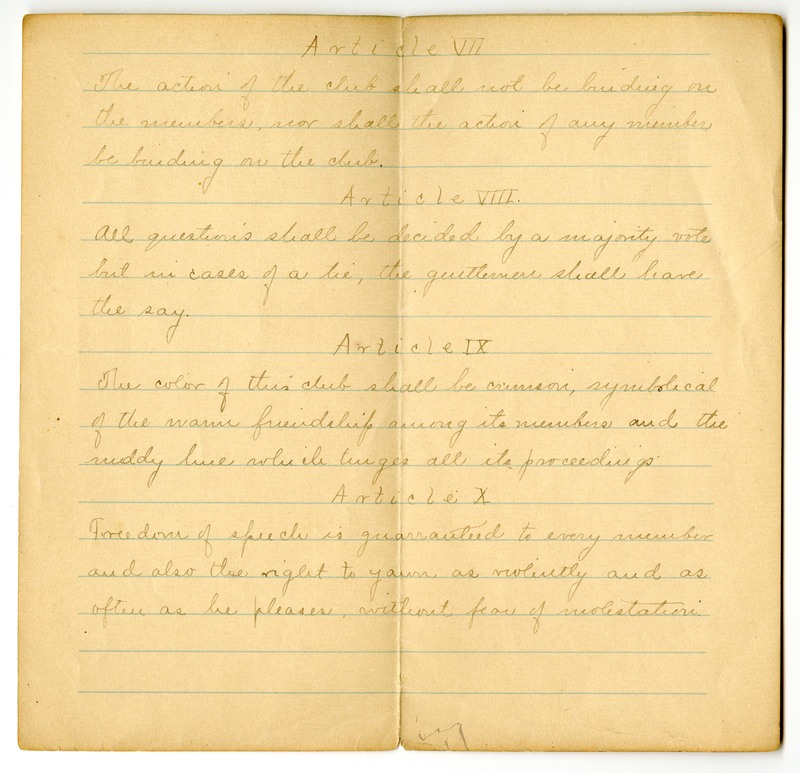 Constitution page 1, Moonlight Pleasure Club constitution, Collection C629, Indiana University Archives, Bloomington. Constitution page 2, Moonlight Pleasure Club constitution, Collection C629, Indiana University Archives, Bloomington. Constitution page 3, Moonlight Pleasure Club constitution, Collection C629, Indiana University Archives, Bloomington. Constitution page 4, Moonlight Pleasure Club constitution, Collection C629, Indiana University Archives, Bloomington. Constitution of The Moonlight Pleasure Club 1892. The purpose of this club shall be to have an awfully nice time, and anything which tends toward education or intellectual improvement shall be looked upon with disfavor and suspicion. This club shall consist of four members; of these two shall be gentlemen and two shall be women. This club shall have no officers; all members shall be on an equal footing but of course in cases demanding a high grade of intelligence the women shall give place. This club will meet whenever it has a chance or whenever any body invites it out. In urgent cases any member may call a meeting and one person shall constitute a quorum for transaction of business. The Action of the club shall not be binding on the members, nor shall the action of any members be binding on the club. All questions shall be decided by a majority vote but in cases of a tie, the gentlemen shall have the say. The color of this club shall be crimson, symbolical of the warm friendship among its members and the ruddy time which tinges all its proceedings. Freedom of speech is guaranteed to every member and also the right to yawn as violently and as often as he pleases without fear of molestation. The initiation fee shall be paid right away by each initiate and shall be the price of one pair of shoes for each of the charter members. During the cold spells the senior members reserve the right to impose a repayment of this fee as often as they choose. The right is reserved to each initiate to do as he pleases about paying this. This club will encourage as far as possible the use of the truly Hoosier expression “didn’t get to.” Everything that is Hoosier shall be welcomed and anything that savors of the worn out east shall be discountenanced. Contact the IU Archives to see the Moonlight Pleasure Club constitution in person.